Super Eagles coach, Gernot Rohr, has said that Middlesborough’s new signing, John Mikle Obi will captain the national team during the 2019 African Cup of Nations in Egypt, unless he makes a formal request to leave the national team. Rohr stated this on the sideline of the Nigeria Professional Football League (NPFL) Match Day 4 between MFM FC and Rangers International FC of Enugu, NAN reports. He also said that the midfielder not only remained an integral part of his team, but the leader as well. 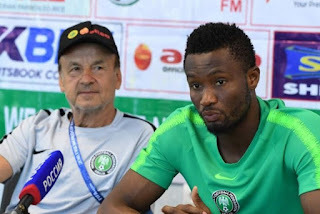 “We are very happy with the news about Mikel joining Middlesborough because it has been a long time he played last for the team, but he is a player who really wants to play for the team. “He wishes to return to Europe to be with his family and find a good club which he has done. Right now, he needs more time to be back in the team because we have yet to see him after the World Cup. “We want him to come back to the national team like other players. If he is playing well with his new team, he stands a chance of coming back to us, but he has not told me he will quit the team. “He remains the captain of the team till he says otherwise, we will be happy to have him back for his experience,” Rohr said.